Three Halifax FA Sunday Cup quarter finals produced an astonishing 35 goals at the weekend. Defenders were clearly in festive mood and Halifax Sunday League top section trio Barge (10-1 against Bradshaw), Carrington (11-2) and Waiters Arms (9-2 against North Bridge) were happy to accept the gifts on offer. Barge made short work of Division Two outfit Bradshaw, who had picked up some big wins themselves recently. 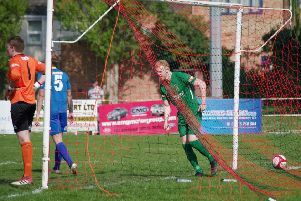 The match was unusual in that it contained a hat-trick of hat-tricks with Jamie Cartledge, Graham Pugh and David Woffenden all netting three times for Matthew Bagshaw’s side. Levi Brown put the icing on the cake for the Brighouse side as they hit double figures for first time this campaign. Barge’s semi-final opponents will be Carrington, who put paid to their County Cup ambitions earlier in the season. Carrington, on their 3G pitch at Trinity Academy, were far too strong for a Pond side which had a spattering of veterans. Pond did create chances, but in pushing men forward Carrington were too clinical on the break. A Paul Taylor pass found Michael Barlow, who rounded players before striking home from distance for one consolation goal. Dan Barnes got Pond’s second following a Lee Williams lay off. Billy Grogan scored a hat-trick as Waiters beat North Bridge for the second time this season in knockout action. Waiters started strongly and David Chappell netted from a break-away. When Adam Fenton and Grogan added the second and third the visitors looked to have the game sewn up. Bridge fought back admirably and a sensational cross from Alex Broomfield was met by defender turned striker Anthony Todd, whose fine first touch allowed a calm finish into the roof of the net. Unfortunately for Andy Blakey’s side, Waiters proved too potent in attack and come the half time interval they found themselves 5-1 down with Grogan and Lee Wood adding to the visitors’ tally. Bridge were unable to turn opportunities into goals early in the second half and Chappell nodded home Waiters’ sixth at the back post. Todd doubled his tally after Alex Conwell beat the Waiters keeper to the ball but Grogan, Chappell and an own goal took Waiters further clear. Waiters will next play the winners of the Halifax Hammers versus Feathers contest. Feathers somehow managed to beat Hollins Holme 3-1 in a delayed second round match on Sunday in spite of being under the cosh for much of the contest at Mytholmroyd. Hollins boss Steve Parker said he was “shellshocked” that his side had only managed to score once. Hollins lost 3-1 to fellow Halifax Sunday League top flight side Feathers in spite of dominating the contest at Mytholmroyd. “We must have had 30 chances and on any other day we might have scored 20,” said Parker. Ryan Jeffries opened the scoring after 15 minutes, being set up by Jake Shaw after a four-man move. However, Feathers struck three times in quick succession towards the end of the half, with Christian Silkstone among their scorers, and Hollins battered away without success in the second half. Referee Mick Denton won praise from Parker for his handling of the contest. Mount Tabor won the one Premier Division game, beating Top Club 4-1 in a basement battle to climb above Barge and Feathers. The one consolation for Top Club was that they scored the goal of the game. Rob Tuna made the pass to team-mate Brad Main and he half-volleyed a lob over the Tabor keeper from his own half. In Division One, Lee Mount and King Cross Park had their expected home wins to maintain their pursuit of Halifax Hammers Reserves at the top. One goal was enough for Park to beat rock bottom Halifax Rangers while Lee Mount were more handsome winners by 6-2 against lowly Oddfellows. The Division Two title has been settled before Christmas as Fountain Head beat nearest title rivals Triangle 6-3 to collect the silverware early in the seven-team section. Halifax Amateurs showed bottom side Halifax Rangers Reserves no mercy, beating them 13-2. With fixtures running out in the bottom tier, the league committee will introduce a new cup competition at the start of 2017. The next fixtures are on January 8.